What is a Customer Digital FingerPrint? Have you ever visited a website that tells you that you have 15 minutes to finish your purchase only to come back to same website the next day and see the exact same message? With Discount Ninja you can avoid this to a large extent and create much more real scarcity. The app ensures that, when the visitor comes back after 10 minutes they will see they only have 5 minutes left. If their deadline expired the promotion will be canceled for them. Go to Settings and find the "Cache" tab. Ensure your setting is: "Same device and browser"
What does it mean for my visitors? What do those 3 settings mean? 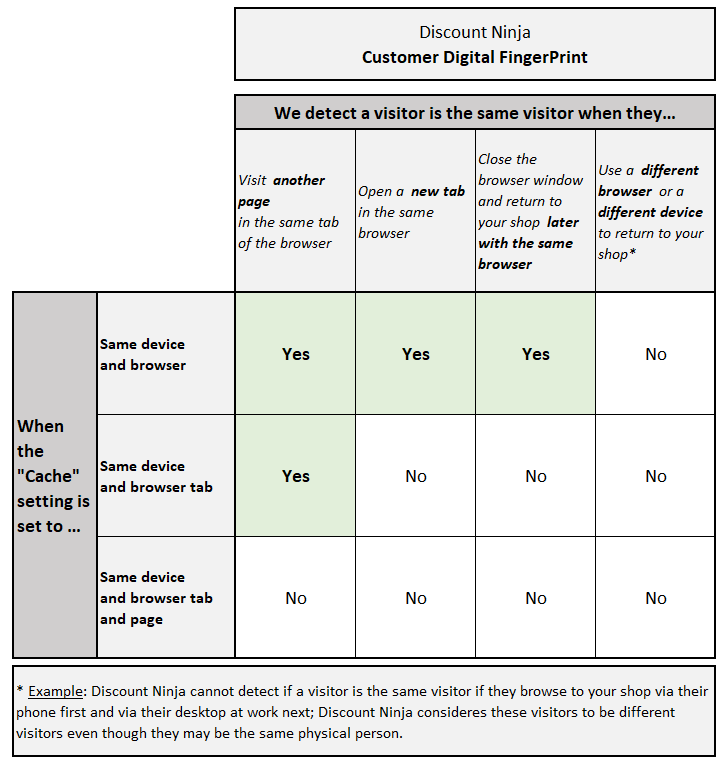 The following overview explains how the different Cache settings impact how Discount Ninja identifies returning visitors.